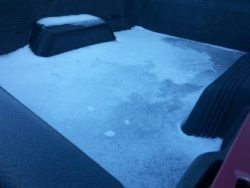 A half-inch of snow and Tecumseh Sherman have only one thing in common. They can completely destroy the South without any resistance. Georgia simply doesn’t have any plows. You want to get from Point A to Point B when it snows here? You better have a toboggan or an incredibly high tolerance for idiots who think four-wheel-drive can actually work on an ice skating rink. I got lucky. By the time I came to the auction today, there were only a bit over 50 dealers at a time when there are usually over 100 and change. A lot of folks will use their dealer licenses during the time right before tax season. A unique time between late February and early June when a lot of poor folks get a healthy tax refund thanks mainly to the Earned Income Tax Credit. Working class folks get their fair share as well. But for every $6000 refund for a large family with a small income, there is maybe a $1500 return for a small family with a moderate income. Does that sound biased to you? It shouldn’t be. I have been in the car business since 1999 and that’s just the reality of how the numbers work. Speaking of which I bought five cars today. My personal favorite also happened to be the most expensive. 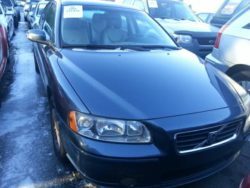 A 2007 Volvo S60 with about 130,000 miles and enough maintenance records to be an easy flip for five grand if everything works out. I bought it for $3000 plus the $240 auction fee. Did I get to drive it? Nope. 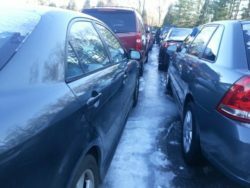 These cars are parked within inches of each other and today I did more slipping and sliding than most folks will do in a skating rink. Life’s interesting when you have to literally keep your hands on a vehicle to get from one to the other. But it also helps limit competition which was a big theme for today. On the low end was a 21 year old Volvo 960 with the Check Engine light on. I guess this is a good time to tell you that most check engine lights come standard on older Volvos. They are hell to sell in an emissions county because the OBD monitoring systems on these older Volvos tend to be hypersensitive. “That thing is a God awful emissions nightmare!” I was told that right after I bought it. What the fellow didn’t know is my dealership borders four different counties that don’t require emissions. 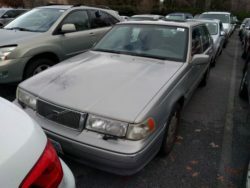 This Volvo has only 117,000 miles and it should be an easy sell. I got it for $700 plus the $130 auction fee. Two vehicles I was less than an enthusiastic about because they pretty much hit the very tip of my highest bid price. 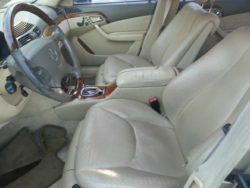 This Mercedes S430 looks like a million dollars in person. The hard part is maintaining them. 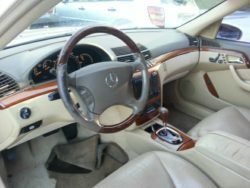 These vehicles are not so much complicated as they are intimidating, and a lot of owners try to go on the cheap when it comes to an older Mercedes. I think I got lucky, but time will tell. 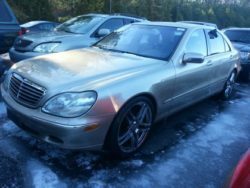 This S430 was maintained at the local Mercedes dealer as well as a nearby Mercedes shop, and that’s 2 for 2 in a world where too many owners try to shuck these vehicles to a Pep Boys or worse. It’s right at 200,000 miles, and yes. That’s a bit high. But remember what I was telling you about tax season? 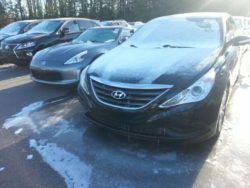 These vehicles are a quick sale during that time period, and with 31 service records at places that charge north of $120 an hour for labor, I believe the price of $2200 plus the $220 fee will be decent enough. Plus I can always sell those wheels and go to a less blingy set if I still see it on my lot by late May. Old Volvos and old trucks are my two biggest weaknesses and truth be told, I got a bit dumb on this one. 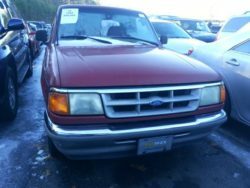 $1200 plus a $185 fee for a 1994 Ford Ranger with 250k. It needs nothing but I’ll frankly be looking at maybe $2000 as the sale price for this one. Or, I can finance it for $600 down and $50 a week for 15 months after changing out all the fluids, and then pray that the vehicle will make the note. It wouldn’t be the highest mileage vehicle I have financed if I went that route. That honor goes to a Buick Park Avenue with over 330,000 miles that really did make an 18 month note with zero issues. 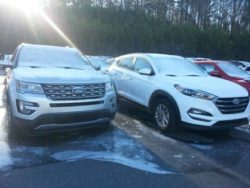 A lot of folks up in the North don’t understand that the only thing which wears out cars out in North Georgia are the heat, which uglifies the interior, and stop and go driving, which doesn’t really exist outside metro-Atlanta. If it were an automatic, it would be the last truck for a retiree. But since it has a stick, it will be the first truck for some high school kid that needs to get from Point A to Point B. My last buy was a ‘Blah!’. 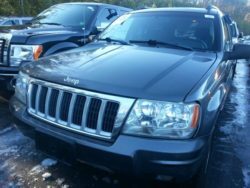 A 2004 Jeep Grand Cherokee Limited that became a family’s third vehicle after a long daily driver run. I look at Carfax histories religiously, and this one told me that the folks who owned it went from a 15,000 mile a year regimen to the Jeep, to only 3,000 miles a year while taking it in to the local Jeep dealership for service. 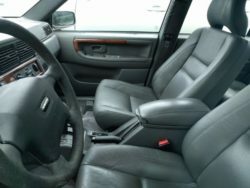 It had the tune-up done a year ago and accumulated a grand total of 179k miles before the folks who owned it sold it off. I bought it for $2200 plus a $240 fee, and it will likely cash out for $3500. 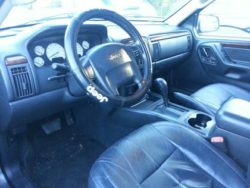 I have financed several of these vehicles for $700 down and $60 a week for 24 months. Today’s credit happy world makes that a no-go, since honestly, all you need to get a car financed is a pulse and a paycheck. Bad credit almost doesn’t exist these days. On the new front I did see this 2014 Toyota Camry SE with 23k miles go for $11300 and a 2010 Chevy Camaro LT with automatic, leather and 78k go for $12200. 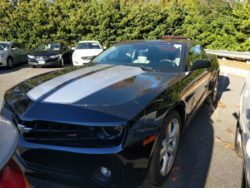 The Camaro was good to go while the Camry had structural damage that was not recorded on the Carfax. The local Toyota dealer will more than likely be selling it to a credit challenged customer who is A-OK with paying 12% interest on a 7 year note. Why? Because $300 a month seems pretty reasonable for folks who can’t do the real math. That was all for today. Remember to stay warm!